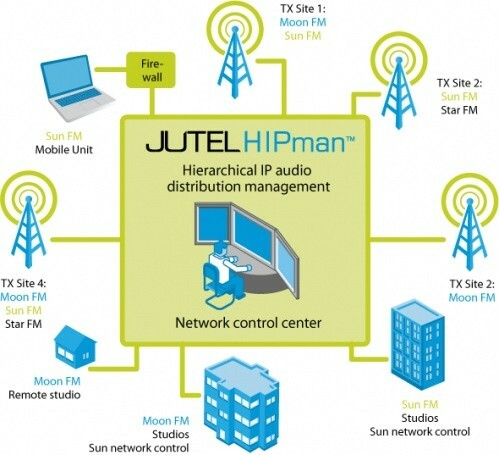 JUTEL HIPman is a Hierarchical IP audio distribution management solution, which provides a high-level control and management layer to IP audio network devices with specified access rights for organizations, groups and individuals. It simplifies the control of broadcasters' IP contribution and distribution networks providing significant operational cost savings. Several organisations can independently utilise their own resources within a larger IP audio network, making the HIPman solution ideal not only for large broadcasters but also for audio distribution service providers. What is more, access rights to the broadcasting system can be assigned according to individual needs. You can see and control only the devices and streams you have permission to. Changing from traditional audio technology to IP audio brings significant savings in audio connection costs inside radio stations, and especially in audio contribution and distribution. Many broadcasters and audio/video distribution service providers have started to use QoS guaranteed IP networks, like MPLS, as the backbone for audio distribution and contribution. Along with the development of reliable IP audio networks, broadcasters have now a real choice to select a new technology and service provider that not only is cheaper, but also makes the user experience more flexible. Standard (N/ACIP compatible) IP audio codecs and reliable IP networks have been successfully used by broadcasters for quite a while, but how are these networks and devices controlled? The network provider takes care of the Quality of Service of the network according to the service level selected by the customer. But how do you control the codecs in the network? Every codec manufacturer have their own control software to control the technical parameters and read the status of the devices. The control is either Web browser-based (each codec has to be controlled separately), proprietary control software or a physical connection through a serial port. Too complicated, isn't it? Jutel took the challenge to overcome these problems and started developing a new platform to hierarchically manage networks of IP audio devices. As a result of this development, HIPman was born in summer 2009. IMAGINE a solution where you can build ready-made sets for your daily switching tasks; easily modify your sets; control individual streams as well as groups of streams; build custom software control panels to switch single or multiple streams; define users and user groups and assign them user rights; monitor the devices and their status in the network; monitor all the streams in your network, and handle multiple manufacturer codecs within one system - IMAGINE JUTEL HIPman!